The Organisation for Economic Co-operation and Development (OECD) is one of the founding partners of the Global Deal. 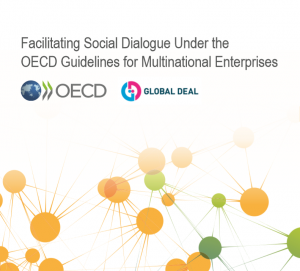 The Organisation has developed the OECD Guidelines for Multinational Enterprises. The Guidelines are recommendations on responsible business conduct addressed by governments to businesses operating in, or from, adhering countries. They provide non-binding principles and standards for corporate responsibility in a global context and they are consistent with applicable laws and internationally recognised standards. Social dialogue is embedded in the Guidelines, and the provisions explicitly require companies to consult with social partners as part of their due diligence processes. A unique feature of the Guidelines is their built-in grievance mechanism – the National Contact Points (NCPs).